The Trek Lush Carbon 27.5 can’t get enough flowy single track and all-day adventures. We like it in this wheel size, but since this is its first year as a “tweener,” we think a second look at the new geometry would help with some of the handling issues we experienced from the front of the bike. This 2015 Lush features a snappy spec that includes a RockShox Reverb Stealth dropper post and a truly impressive, Lush-only version of Trek’s RE:aktiv FOX suspension that helped make the back of this bike the life of the party. In Trek’s Lush, you can clearly see the cycling industry’s ongoing wheel-size discussion. Since inception in 2012, it has been available with 26-, 29- and now for the first time, 27.5-inch wheels. It shows Trek’s dedication to giving riders what they want, but perhaps it’s also a sign of rushing to respond to the market. With each new Lush offering comes new geometry, and for us this version didn’t always work. It also reminded us that when choosing a bike, geometry is queen. Don’t spend a penny before taking a real test ride (not just a lap of a parking lot). And never buy in to the idea that one size fits all. You wouldn’t shell out for a new outfit before trying it on, and it’s the same with a bike—especially a $5,560 bike. GEOMETRY IS QUEEN – Don’t spend a penny before taking a real test ride (not just a lap of a parking lot). And never buy in to the idea that one size fits all. Thanks to the growing amount of data and market research about female cyclists, Trek has done a solid job of figuring out what makes a women’s specific bike work. Though most closely related to a Fuel EX, the 2015 Lush features a new design that’s all its own. Revised frame geometry moves a rider’s center of mass forward, putting the body less upright than in previous Lushes. A steeper seat angle, taller head tube, shorter top tube, and confidence-inspiring shorter standover all accommodate women’s tendency to ride more from the legs, rather than working the bike with their upper bodies as is common in men. The idea is to distribute weight more evenly between the wheels. The 2015 Lush Carbon also gets its own suspension set-up, not just a men’s carryover. This bike is outfitted with Trek’s new RE:aktiv technology customized specifically for this bike. 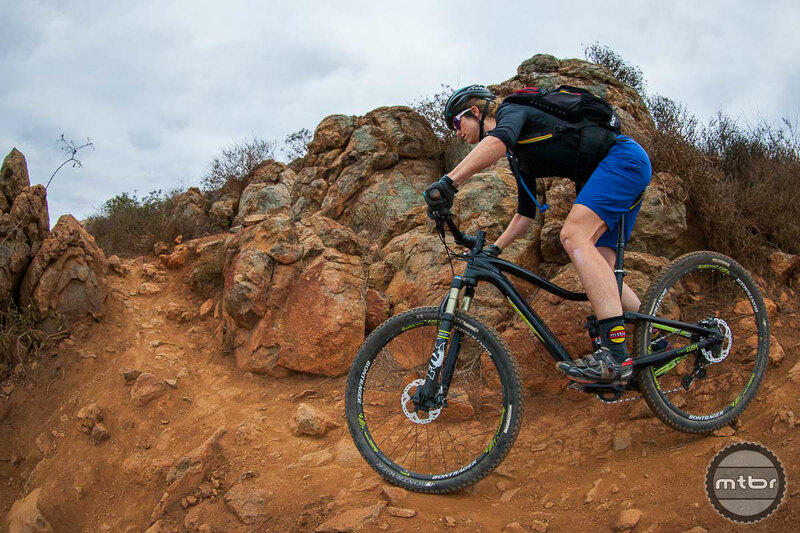 The RE:aktiv shock features regressive damping to deliver efficient pedaling, but when you hit an obstacle, it’s engineered to get out the way, smoothing out the trail, and keeping your rear wheel on the ground. You won’t find the Lush version of this rear shock on any other bike. It has a higher leverage ratio, meaning smaller riders can more easily activate the suspension. Initially, at my 125-pound riding weight, I ran the shock at the same, typically low 75 PSI I always run. I was quickly running through all the suspension, losing energy in pedaling, and sinking into the back, which lightened the front end and led to some sloppy front end handling. When I increased the pressure, eventually reaching a happy 140 PSI, the ride improved remarkably. My weight was more centered, the back of the bike stuck through corners without feeling sloppy, and I noticed an immediate improvement in pedaling. However, the handling in the front never totally went away. 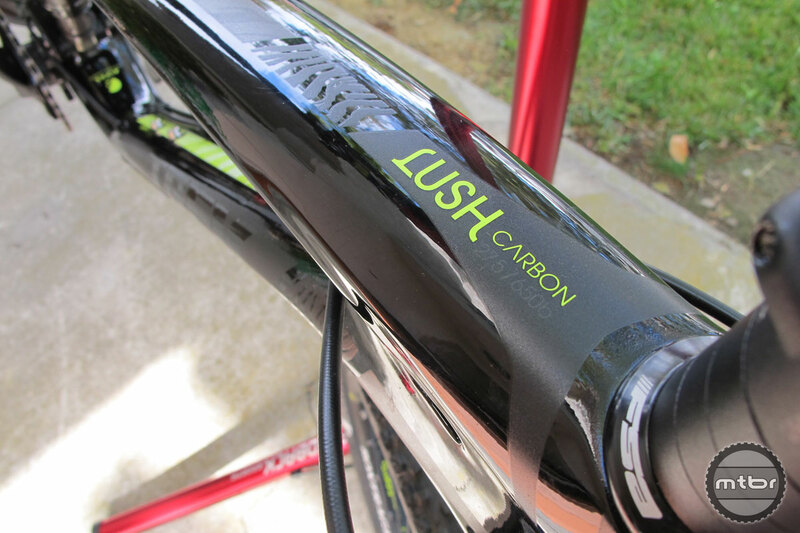 Finally, the most noticeable change for 2015 is the Lush Carbon’s new paint job. Black never goes out of style, helping solidify this rig’s resale value. And with its subtle zebra-stripe motif and small hits of fluorescent yellow, the bike looks ready to party. Trek Lush’s OCLV carbon fiber frame looks good in duo-texture black. Finding the balance between high-speed stability and low-speed nimbleness is always tough, and we found the Lush to be a little wobbly. 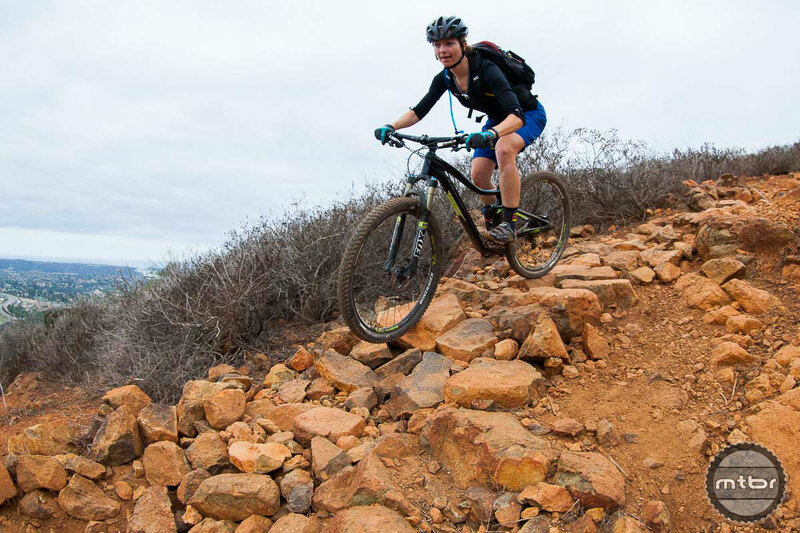 It does fine on moderately rolling terrain, but as pitch increases—especially in sudden situations such as step-ups, clearing rocks or roots, or turning through tight switchbacks—keeping control of the front end became trickier. It was sometimes difficult to keep weight on the front wheel. On steep climbs, we encountered unexpected wheelies that threw us off track. The tall head tube is likely part of the problem, as it raises a rider’s torso. The stock 660mm bars also played a big role. Even after experimenting with the spacers and stem to bring my weight down, the bike felt unstable on switchbacks and steep descents. Wider bars (at least 710mm) would help lower the torso to a more stable position. But instead the bike stumbled past “quick handling” and landed in “twitchy” territory, especially when leaning into flat corners or trying to stick a line over a skinny, or up a technical climb. We’d also prefer a 30-tooth chainring over the spec’d 32t, which for us was too tall a gear on tough climbs. But point the Lush Carbon downhill and it comes alive. We had a blast popping off small drops and railing bermed turns. The bike’s slightly upright position was comfortable, and we were able to put power into the pedals without any detectable shock bob. 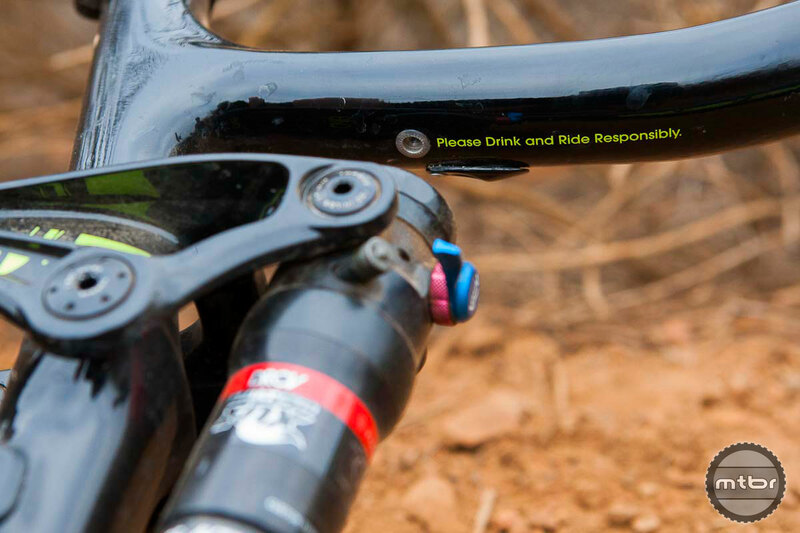 Trek’s RE:aktiv rear shock with dual rate control valve (DRVC) technology also shined on rough trail, at high speeds, and on bum-ALL-the-way-back-hanging-on-by-your-fingernails descents. The rear wheel stuck to the trail and the bike remained confidently in control even when we were careening over big baby heads or chunky roots. We also had little problem with moderate drops. Same goes for moderate descents. Because of the shorter top tube (effective length 58cm for our size 17” tester), we had no trouble getting behind the saddle even with the seatpost fully extended. Weighting also felt equalized between wheels, restoring our confidence in steering. Perusing the spec list of Trek’s Lush Carbon 27.5 trail bike is enough to make a girl giddy. It’s loaded with features riders are talking about, including the SRAM X1 drivetrain, RockShox Reverb Stealth dropper post, and Shimano XT brakes. SRAM has pulled away from the pack with their 1-by system, and many riders now swear by the weight-saving, simplified shifting. The single ring drive train also helps clean up the cockpit, leaving the left side of the bar free to host only the dropper remote. However, the Lush came with a “left” remote installed on the top of the bar, but we would have preferred a “right” mounted under the bar on the left side. The Reverb Stealth is a proven choice when it comes to dropper posts, and we had no trouble with it throughout our testing—always reliable, and we like that you can set it at any height between fully extended and fully slammed. However, the aggressive angle on the internal routing as it heads up the seat tube raised our eyebrows; we would worry about long-term performance, and wear and tear on the housing. 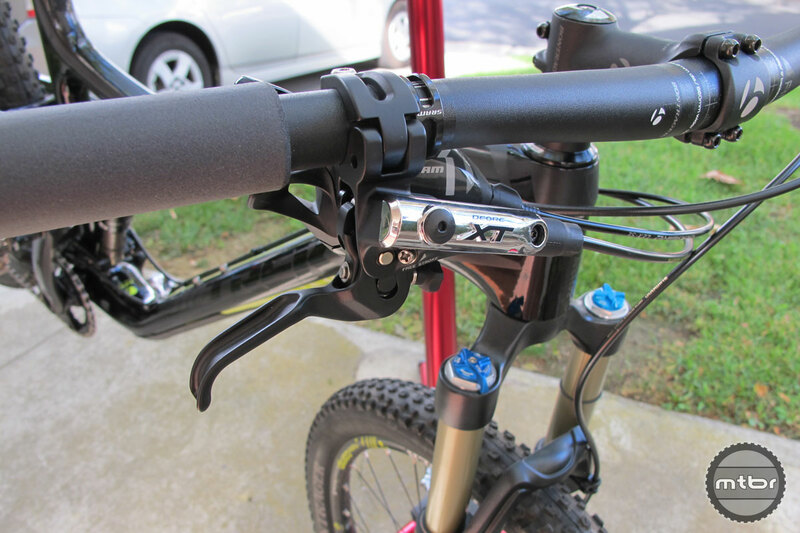 We also liked to see XT brakes spec’d. We find they are easy to adjust, rarely rub, and since they use mineral oil, they are less messy to maintain. We also like the short levers which allow for controlled, one-finger stopping. Combined with Trek’s ABP (active brake pivot) technology, the suspension stays active and effective whether you’re on the gas or on the brakes. Trek brings Shimano to the party with the always-reliable XT braking: Good adjustability, rare rubbing, and the power of mineral oil. The wheels however feel like an afterthought. We would have hoped for higher-end hoops on this high-end bike. We do appreciate that the Bontrgaer Rhythm Comps help keep the price down, but you might want to think about an upgrade if you bring the Lush home. Keep the tires though, the Bontrager XR3 Expert tubeless set up that came with the bike worked for us in a variety of terrain, rarely breaking traction. The wheel set plus tires and cassette came out to 9 pounds, 7 ounces. We think there’s room to cut weight here. And speaking of keeping the price (and weight) down, we like ESI grips for being light and inexpensive ($16.99 a pair), but be prepared to change them frequently. We quickly scuffed ours up. We’ve bought 2 high end women’s specific bikes in the past three years (currently a trek lush SL 29) and both bikes had crap forks which were a joke and practically rigid with a light female rider unless you ran pressure way below the lowest recommended setting. It a shame that you still have to spend at least a grand to upgrade a 3 – 6 thousand dollar bike to make up for intentional short speccing by major bike companies.